The 10 Best BBQ Joints in West Virginia! Grilling burgers and hot dogs in the backyard has often been confused with real down-home barbecued meat. Grilling meat is done over an open fire, but barbecue is done to a large portion of pork, beef, or chicken that is smoked indirectly, usually inside a smoker or closed pit. Rooted in the South, there are several styles and varieties of barbecue. Some are sweeter, others have a deeper, tangy rich mesquite flavor. You might be asked if you like your barbecued meat wet (with sauce) or dry (with only the dry rub seasoning). In any case and whatever style, flavor, or meat you prefer, you’ll find 10 of the best barbecue joints in West Virginia below. Try them all! Dem 2 Brothers and a Grill in Charleston, West Virginia is the result of what happens when social media goes crazy with positive ratings. What started as just an out-of-state trip has turned out to be one of the fastest growing, most popular, and delicious BBQ joints in the state! With 2 restaurants and 2 food trucks, this is the place to get Southern-style BBQ with all the fixin’s. That usually tastes like pulled pork BBQ, sweet potato casserole, collard greens, baked beans, and macaroni and cheese. They gladly deliver for a small fee and are available to cater any occasion. With a catchy name like When Pigs Fly, this little barbecue joint in Lewisburg, West Virginia, is turning heads. They offer a daily lunch buffet and on Sundays, you can eat till you’re full at the All-You-Can-Eat Buffet. This is great food at great prices and in a homey, friendly atmosphere. You’ll want to try everything on the menu, but make sure you taste the Bar-BeCuban, a pulled-pork sandwich with mild sauce, ham, Swiss cheese, pickles and mustard made on a Panini press, or the Hawaiian Luau, a pulled-pork sandwich with pineapple salsa, and a special homemade Asian barbecue sauce. Kids’ menus and portions are available. 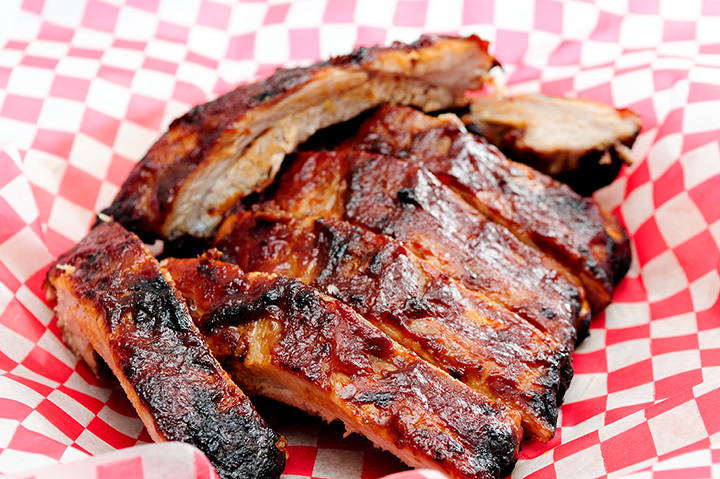 With three locations to choose, you can stop and try the mouthwatering smoked barbecue almost any time you please. Besides amazing customer favorites like the smoked prime rib and baby back ribs combo, they serve crab-stuffed catfish, smoked chicken, and beef brisket. Live entertainment and a full bar complete your finger-licking dining experience. Although the restaurant closed, Captain Jim’s BBQ & More is still worth mentioning because of the rave reviews on social media. Available for catering almost anywhere, Captain Jim’s s a family-owned and operated food service that features great barbecue at reasonable prices. What could be better than sitting outside on a warm summer evening enjoying a platter of secret rub-smoked chicken, pork, or beef with your sauce of choice and one of the delicious sides like potato salad, baked beans, cole slaw, or hushpuppies? Buddy’s is laid back, friendly, and always has cold beer. They’ll cater your next special event, too. From the checkered tablecloths to the friendly staff and awesome barbeque food, Rollin Smoke BBQ in Charleston has two restaurants and food truck that will help you satisfy your need for great barbecue. Great prices for combos that include a barbecue sandwich with or without coleslaw, pickle and chips, or a dinner platter that has one meat or sandwich, two sides, roll and butter. Besides the traditional pork, beer, and chicken, you can try the smoked Cornish hen, smoked spicy link sausage, or wings. For outstanding barbecue that’s worth the drive to Pipestem, West Virginia, Brandon’s BBQ & Grille is the place to go. Besides traditional sides, you can order crispy onion rings or fried green tomatoes to go with your barbecued meat of choice. If you want food that sticks to your ribs (pun intended), try the pulled-pork dinner with garlic and cheese mashed potatoes and baked beans. Authentic hickory-smoked barbecue is what you’ll find at A Taste of Memphis, but it’s not in Tennessee. Located in Princeton, West Virginia, your biggest appetite will be filled by melt-in-your-mouth ribs, platters, sandwiches, and sides. Specialties of the house include barbecue nachos, homemade potato skins, fried green tomatoes, giant baked potatoes, cinnamon apples, and hushpuppies. Children have their own menu for smaller appetites. If you like them here, you’ll love them at your next catered event. Come hungry, but be prepared not to go away hungry. The generous portions at the Smoke House in Glenville, West Virginia, will definitely fill you. A hidden gem with true Southern-style barbecue smoked on a grill and created from a family dry rub recipe right there on the property, you’ll find great food at great prices at this family restaurant. They also have a nice variety of homemade sides, and you can choose from barbecued beef, pork, and chicken in salads, in wraps, on buns, or on the rib.